Nothing’s more exciting than a grand opening. Being a new business owner boasts many rewards, and planning the opening of your first retail location is definitely exhilarating. With that said, it’s important you stick to the logistics, and don’t get too caught up in the pre planning excitement. On grand opening day, you want customers to be beating down your doors. So, how exactly do you go about promoting your first grand opening event? Give SMS marketing a try. Did you know that 99% of all text messages are opened within the first five minutes of delivery? If done correctly, these mind blowing open rates will definitely yield great results. But, first things first, you must gather interest so you can grow your list. Here’s some great ideas to get you started. Put a huge sign in your front window. Place a huge sign or banner in your front window that promotes the opening date, plus an exclusive SMS offer. Keep it simple, and make sure to include further details in your auto reply message. Put up a few posts on social media. You should be working on developing a social presence long before your grand opening. At the bare minimum, at least claim a Facebook Business page. This will help you connect with local community members, and share grand opening details. Word of mouth marketing increases trust, and since SMS is still a newer concept, you want your subscribers to know exactly what to expect. Don’t be afraid to ask friends, family members, and potential customers to join your list. If they care about you and your new business, they will want to stay connected. 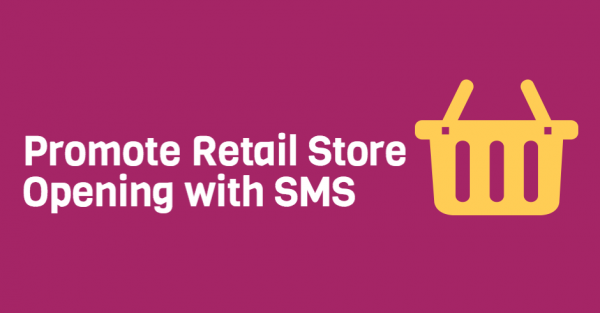 Partner up with top text marketing service for retail stores. Give us a call today at 1.800.688.6290 to learn more, or hop over to the pricing page and sign up for your free plan. We boast a feature rich platform that empowers all small business owners nationwide to succeed. After signing up, stop by our SMS Marketing Learning Center and give the beginner’s guide a quick read.